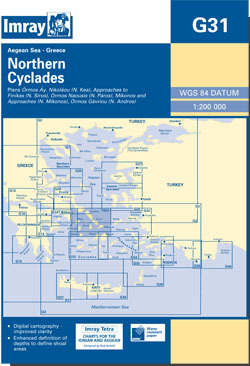 The northern Cyclades from the southern tip of Evvoia to the northern tips of Paros and Naxos. Scale: 1 : 189.700. Larger scale plans of of Ormos Mikonou (Mikonos) Ormos Gavriou (Andros) Limin Aghiou Nikolaou (Kea), and Limin Sirou (Siros). For this 2014 edition the chart has been fully updated throughout. The sketch plan of Órmos Gavriou has now been replaced with a fully-georeferenced and WGS84-compatible plan.